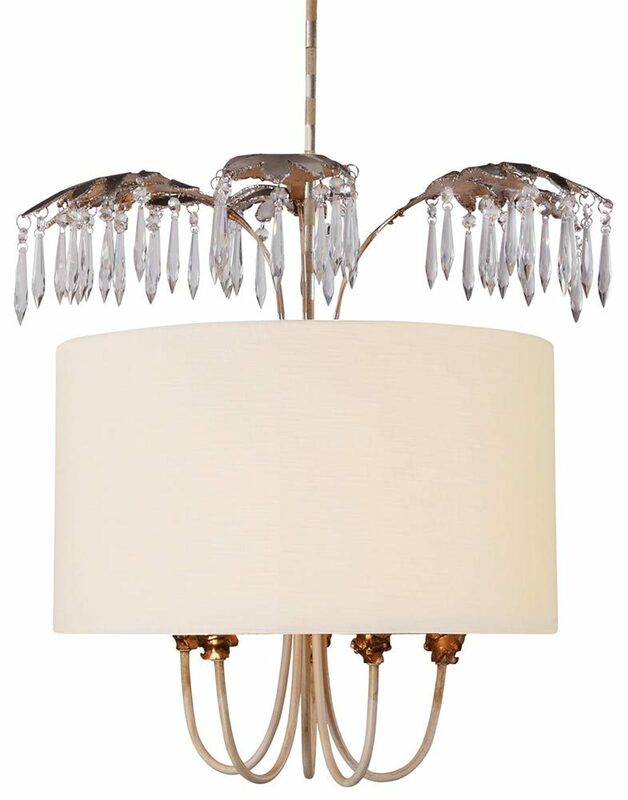 The Flambeau Antoinette 5 light ceiling pendant in cream with crystal drops is contemporary, flamboyant and features New Orleans style. Ceiling mount and height adjustable rod in striped cream and silver leaf, with curving five-arm chandelier surrounded by a cream linen drum shade. Each arm features a gold leaf bobeche and sparkling crystal drops hang from sculpted leaf elements on slender stems. This ceiling light features a cornucopia of style and colour. The hand applied finish varies slightly making each one a unique piece and the crystal adds sparkle and that special touch. The designer Paul Grüer has expressed his creativity with this unique design so that you can have a flamboyant lighting piece in your home. This New Orleans style ceiling light looks fantastic in a reception room, dining room, bedroom or hallway and is sure to be a conversation starter wherever it’s placed. The classy design works for so many interior styles and makes any room as individual as you are. Supplied with two 30cm rods and two 15cm rods that can be used in any combination to achieve the perfect drop, please see the technical information below for dimensions. Supplied by Elstead Lighting and designed by Flambeau in New Orleans who offer unique and distinctive lighting collections. Working with specialist designers who model up their own original creations using distressed finishes of gold and silver leaf to create 21st century antiques like the Antoinette 5 light ceiling pendant in cream with crystal drops you see here.